A blue ribbon flower, that is. I learned a few things sewing this one that weren’t really things I even thought about with the first pink one as that one was all batiks. 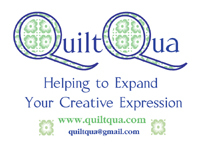 I thought the darker blue was perfect as it was not one of the thicker quilting cottons. Clearly not as fine as a batik, but it was – or so I thought – more than good enough. I was wrong. The lighter blue behaved perfectly, but not the darker one! It frayed when I was circling the intersection where all 12 of the flower petals meet. So lesson learned. I will be very careful about my fabric choices for the ribbon flowers and think I’ll probably use a mixture of fabrics which will include at least one batik. And I’ll definitely press the pieced arcs before joining them with the others. Then I spent ages looking for just what fabrics I might use for my next ribbon flower. I think it’s going to involve some red as I keep going back to a particular red batik. I know I have what I think may be the perfect pink to go with it – I just have to find it. I think it may be still with the fabrics that I used in the Joseph’s Coat top as I’ve kept them isolated in case I want to go back and add another row to it. I’ll print the shapes for the next ribbon flower tomorrow and it may get done in time for Monday’s post. But oh, my – yesterday, I was pulling more and more fabrics and think I may have enough combinations for quite a few Ribbon Flowers already mostly chosen. Thursday afternoon, Jake had sole possession of the kitty tree until Baxter landed on the lower level. Usually when Baxter does that, it’s the beginning of some jockeying for that top perch – but not yesterday. Yesterday Jake was letting it be known, with a series of paw taps on Baxter’s head, that he was not giving up possession of that top tier. It went on for quite a few minutes. While most of the shots were too blurry as they were moving, I did manage to capture this one. It is very pretty! Do you still use the same printer (as you did in 2013) to print on your fabrics? I can’t remember if I had the red Canon MG7120 back in 2013, although I’ve had it for a few years now. I love it – it prints perfect shapes every time and allows me to set custom sizes as much as I want. When I have to replace it, I’ll definitely buy another Canon printer! Oh Cathi! I LOVE the blue!! And the difference between the two!! I’ve dealt with uncooperative fabric before….. not fun at ALL! I think the trouble was worth it though. weeding the garden today and working with some yearlings…. I love the look I got with those fabrics too – and you’re right, it was well worth the effort!! A lot of the newer prints ravel quite a bit. It isn’t so much a problem with machine piecing because you aren’t handling the fabric as much as you do with hand stitching. It wouldn’t have been a problem had it not been for the fact it was one of the fabrics that were part of the 12 points joining in the centre. I’ll probably use it again in another one of these blocks, but just in a different position in the block. Silly Kitties! 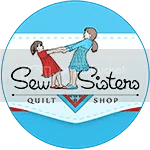 ❤ Quilting – still cheaper than therapy! They are very silly sometimes! I love the blue Cathi. Too bad it caused problems because it’s so gorgeous I’d have loved to see more of it. However I’m sure you’ll come up with wonderful other ribbon flowers. Thanks, Liz. I love that blue too and may very well use it in another block, but not in a position where it has to join up in the centre as that was where I had the worst of the problems with the fraying. I love the blue! I think this pattern done in all of the primary and secondary colors would look really nice! I like that Jake is brave enough to say he’s king on the hill today, to Baxter! Wow – that blue seems to have been almost everyone’s favourite so far! I will use it in another block but definitely not in a position that involves meeting in the centre! Hmm – I sort of like that idea of the primary and secondary colours! But you know me – it will have to include a lot of pink!! blue, my favourite, but a while ago I used cotton instead of my usual batik, and the fraying!!! What about Liberty blues? are they too fine? Love the toon, so many colour choices there.. 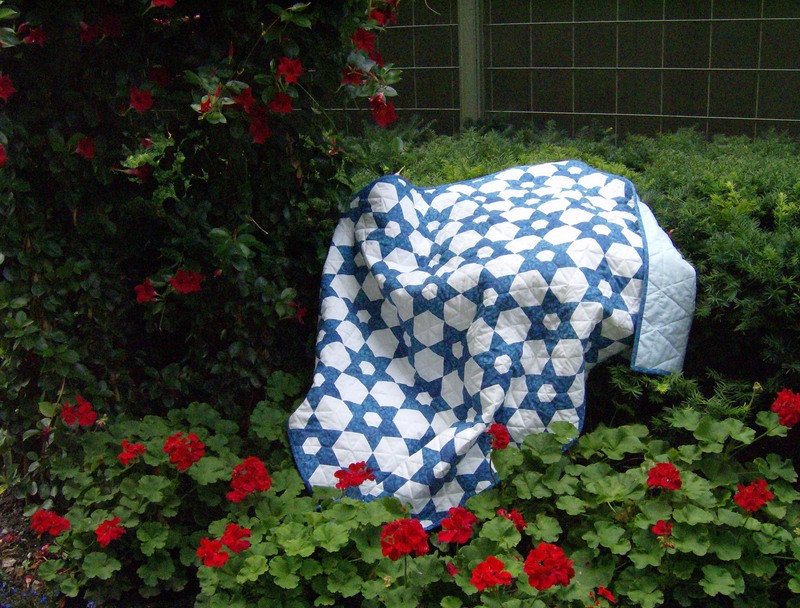 I keep saying I’m going to make another blue quilt. I’ll have to find the perfect blue, but I think I will soon as I love the look of lovely blue and white! I think the Liberty fabrics would be too fine – not to mention too expensive! Batiks are definitely the best – as long as they’re not too thick a batik! Thank you! I really like the look I got using those fabrics, but I wish that darker blue had not frayed quite so much!